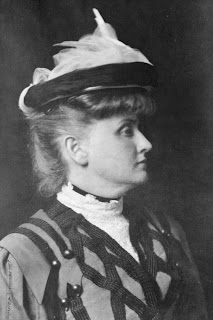 Gertrude Atherton (1857-1948) was born in San Francisco into a broken marriage. By the time she was three years old, her father (a wealthy Yankee businessman) had left her mother, Gertrude Horn nee Franklin (a Southern belle), ending a marriage forced on Gertrude by her parents. Gertrude (the younger) was raised more by her grandfather and nurse than by her mother. Gertrude was a trouble-maker. She made a habit of tricking “the neighborhood children into playing with her by giving them her toys, then beating them up” (Leider 26). Her mother remarried to a successful businessman who went broke, got into gambling debt, and was run out of town by her grandfather. Gertrude Horn married George Atherton in 1876. The marriage was not a happy one. She had a son and a daughter. The son died of diphtheria at the age of six in 1882. George Atherton died at sea in 1887. Later that year, she moved to New York, leaving her nine year old daughter with her mother-in-law. She became the protégé to writer Ambrose Bierce, and much of her writing career focused on the cultural history of California. The story centers on the relationship between thirty-four year old columnist Lee Clavering, and Mary Zattiany, a 58 year old woman who, through modern science, has regained her youth (although this is unknown at the beginning). The story takes place within New York’s high society and there is much criticism of both the older and younger generations in the 1920s. The older generation is argued to be unreasonably caught up in convention while the younger generation is shown as being too eager to flout their straying from those same conventions. Black Oxen is certainly well-written, although the frequent delving into philosophy about youth and age, experience and responsibility, among other things, throws off the pacing in the last 100 or so pages. The title Black Oxen comes from the play The Countess Cathleen by William Butler Yeats. And I am broken by their passing feet. This is where things get odd and fascinating. Yeats and Atherton both received what was known as the Steinach treatment, which was supposed to do exactly what the operation in Black Oxen did: restore youth, not just in terms of physical appearance, but mental ability. Whether or not there was any validity to the procedure, Yeats and Atherton both believed that the procedure worked. In the case of Atherton (and her heroine), the procedure involved light x-ray irradiation of the ovaries. This was supposed to cause the production of hormones that stopped being produced after menopause, and therefore undo some of the aging process. Although Atherton did not publicly admit to having the treatment, that she did have it was an open secret. Additionally, the book was banned from the Rochester library in New York, which raised controversy and public interest. Why haven't I heard about it? Despite the contemporary popularity of Black Oxen, Atherton is best remembered for her books on California. And, as the Steinach treatment became an obscure footnote in medical history, one of the major premises in the book lost that contact with reality. Maybe. It’s certainly well-written, and Atherton raises some interesting points, yet the story seems to repeat itself a lot and drags, especially near the end. You can read Black Oxen on Project Gutenberg. Atherton, Gertrude. Black Oxen. New York: Boni and Liveright, 1923. Leider, Emily. California's Daughter: Gertrude Atherton and Her Times. Stanford: Stanford University Press, 1991. I Just finished "Black Oxen" and like it. The depiction of New York society was humorous and at times scathing. The "Steinach treatment" seems pretty outrageous although apparently it was fairly well known at the time. I read a lot of science fiction so it wasn't hard to get on board. There was a 1923 silent film made, with the lovely Corrine Griffith as Mary and A very young Clara Bow as Janet Oglethorpe (quite the vixen she was). Unfortunately the last two reels of the film are missing. I watched what is available on YouTube and it seems to follow the book pretty well. According to Wikipedia, Clavering ends up marrying Janet.